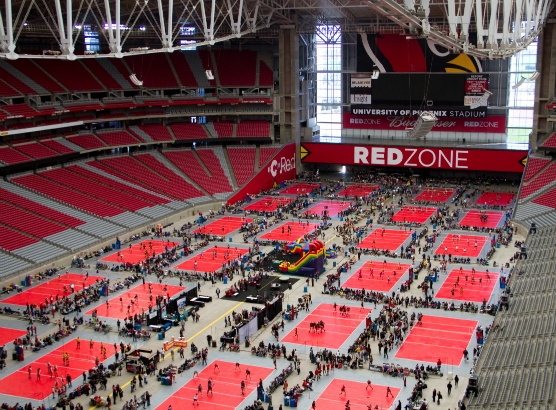 This year, my club volleyball team California Heat had the opportunity to go to the Volleyball Festival, which is otherwise known as Nationals, in Phoenix, Arizona. We left on a Tuesday night at 12 a.m. so we could drive all night. The 4 teams took a gigantic tour bus that drove from state to state. With parents in tow behind us, it took us a total of eight hours to get there. While sitting on a bus for that long is not super fun by any means, it created memories that I will never forget. The bus pulled up to our home for the next week and we all unloaded. After catching up on some much needed sleep, some girls from my team and I explored downtown Phoenix. The next day we had our first nine-hour set of playing volleyball in Arizona, which took a toll on all of us. We as a team are used to long tournaments, but the thought that it was our life for the next week was daunting. After our long days of playing, the team and parents went out to dinner. Not only was playing nine to eleven-hour tournaments with my team a fear that we all conquered together, but also the time we had off the court was unforgettable. It is so interesting how experiences that a group shares together transform us all in the same way. Driving away from Arizona I felt like I did not only leave a 1st place champion, I left with memories I will take with me to my grave.